What Are The Causes Behind Getting Moles During Pregnancy? When Do Moles Get Harmful? Moles, often called as beauty marks, may be on your body since birth or appear and fade away over time. Moles also at times respond to hormonal changes during teenage, pregnancy and old age. These are mostly harmless, except in some rare cases when it becomes cancerous. Let’s find out when a mole can turn hazardous and what moles have to do with pregnancy. Moles are small benign patches or spots on skin. These are dark brown in color that forms because of clustering of Melanocyte cells. These cells are responsible for pigmentation (color) of your skin. Moles are often genetic and are inherited from parents. Moles can be of any shape and size and ranges from 10 to 100 on an individual. They can be flat or bulged, rough or smooth, and some may have hair growing on them. During gestation, a lot of new moles may appear on your body, especially in stomach and breast areas. Existing moles can get darker and bigger. This change is usually benign and happens because of change in hormones and structure of your body. 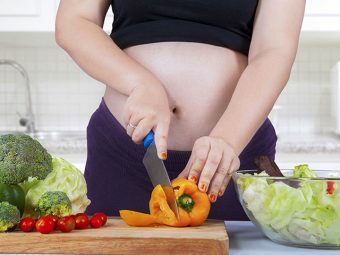 Most fresh formed moles go away post pregnancy. These moles are symmetrical. 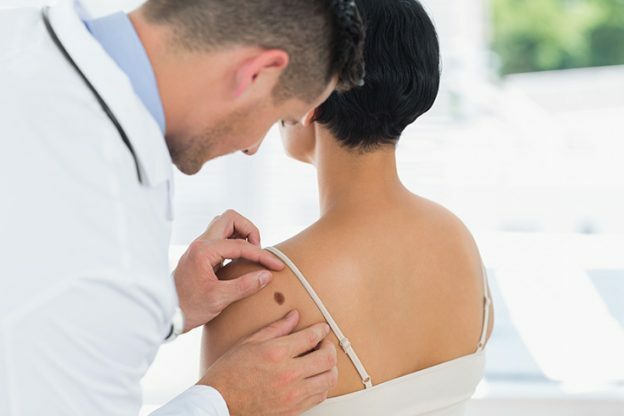 If you observe asymmetrical moles on your body that changes in size color and shape too often, you should get your skin examined by a dermatologist. Most moles are harmless and non-cancerous. In rare cases, these benign moles can develop into Malignant Melanoma, which is a severe and aggressive form of skin cancer. Melanoma is a fast-growing dark spot. It can either be a fresh appearance or a pre-existing one. It often itches, bleeds or turns red. Melanoma is curable if treated at early stages, where malignant is restricted to the surface of the skin. If left untreated for long, melanoma can spread into deeper layers of skin. It can eventually spread throughout the body, which is known as Metastasis. Melanoma in expecting women shows identical signs as that in non-pregnant women. 1. If you have spots or patches on your body that is changing shape and size frequently, bleeds or becomes ulceration and is itchy or painful. These must be examined by a dermatologist as soon as possible. A – Asymmetry, which means half the shape of mole does not match with the other half. In simple terms, the shape of the mole is distorted. B – Border, which means the border or edge of the mole, is not defined, irregular, ragged or scalloped. C – Color, which means the color of the mole, is not same throughout. The spot may vary from shades of red, white, blue, brown or black. D – Diameter, which is greater than 6mm in case of malignant, but can be smaller as well. E – Elevated, which means the mole is not flat surfaced, but rather elevated or bulged. By analyzing your mole with this simple method, you’ll be able to find whether moles growing during pregnancy is risky or not. We hope this article has made you feel more relieved about that strange-looking mole on your skin! It is always good to pay a little attention to your body before things take a serious turn. For more interesting reads, browse Momjunction every day. Readers do let us know your thoughts on getting moles during pregnancy, in the section below.